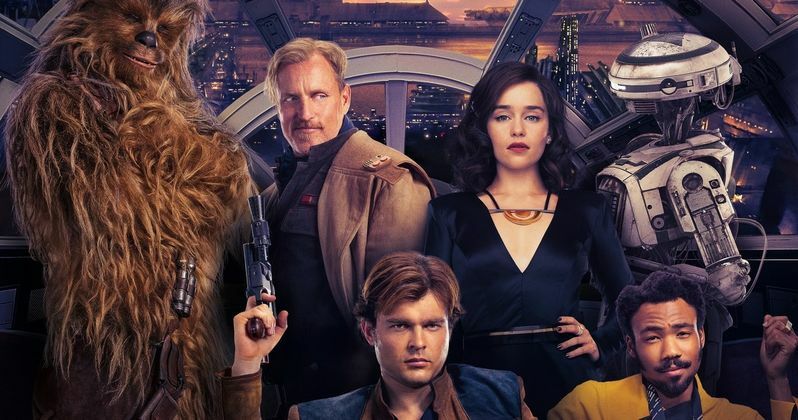 Solo: A Star Wars Story is the least epic installment of the franchise so far. It's a fun ride for sure, but a decidedly more commercial venture. The film does not dig deep into the character of a far away galaxy's favorite scoundrel. It is a summer, sci-fi popcorn flick. Loaded with action, ticking off the requisite boxes along the way. We get the expected first meetings, a whole bunch of new faces, and a surprise slab of filet mignon red meat. Lucasfilm lobs a twist grenade that will have fandom in a tizzy. Enough said, but it is remarkable. The studio is clearly charting a new direction. Alden Ehrenreich stars as Han, a gutsy street kid on the ship building planet of Corellia. Criminality reigns, the dreaded Empire turning the cheek as long as the ships fly. Han steals to survive, along with his best friend and partner, Q'ira (Emilia Clarke). He dreams of being a pilot, owning his own ship, and embarking on exciting space adventures. But the evil grip of Corellia is strong. Han must depend on his tremendous guile to escape. A chance encounter leads the headstrong youth to Tobias Beckett (Woody Harrelson), a seasoned smuggler with crack shot skills. Star Wars is referred to as a space opera. Solo bucks the trend on purpose. It is not aiming for that level of drama or detail. Solo never sits still long enough to establish nuance. The film is a classic example of the ten pages and a bang theory of filmmaking. Unlike Rogue One, it isn't tethered to a specific incident. The goal here is to introduce the known characters in different, interesting settings. There isn't a concerted build-up to their primary interactions. The script by Jake and Lawrence Kasdan can best be described as fleeting in its approach. I can see how this material, in the hands of Phil Lord and Christopher Miller (The Lego Movie), could become too comedic; or prone to improvisation. The co-directors were replaced by Hollywood titan, Ron Howard, during filming. His steady hand is evident. Howard delivers a serious tone when needed, but the focus is clearly on action-adventure. Alden Ehrenreich gives it his all as Han Solo. He has the mannerisms and wide grin down pat, but unfortunately doesn't pull off the swagger of Harrison Ford. The character feels rehearsed. Also, and this bothered me continuously, Ehrenreich looks too short. In scene after scene, his stature, relative to his co-stars and Chewie (Joonas Suotamo), seems diminutive. That's tough criticism that Ehrenreich should not have to face. The production team needed to address the height disparity in a better way. I think Ron Howard would have handled this issue differently if he had been there from the beginning. Two standout performances achieve greatness in Solo. Donald Glover absolutely nails Lando Calrissian. He's so good it's uncanny. It's almost as if his body was overtaken by Billy Dee Williams. Woody Harrelson owns the smuggler routine with gusto. He's the wily veteran showing the young pup the ropes. His role could have been rote and cheesy, but Harrelson brings the gritty gravitas. Ehrenreich is the star, but Harrelson is the backbone of Solo. He's not quite Yoda, but an effective teacher for sure. As a diehard Star Wars fan, I expected more introspection. Han Solo is a complex figure. He's heroic, selfless; laughably hubristic. The Skywalker saga is rich in detail. I was looking forward to Solo giving Han more of that treatment. He's pretty much the character we know from the start. We learn how he gets the Millennium Falcon and meets his lifelong friends, but it doesn't feel like enough. Solo is akin to a Cliff's Notes or Wikipedia summary. You're taught what happens, but have nothing invested in the story. Solo is the first Star Wars film where I didn't feel inspired to turn around and watch it again immediately. That's not a negative, just an honest appraisal. The film is quite entertaining, not a boring frame to be found. It just doesn't leave you awestruck. You get Han Solo 101, but Lucasfilm is more interested in setting up the secondary courses. Solo leaves audiences with an enticing reveal. We'll see where the charming scoundrel goes from here.